Small dogs are definitely adorable and the fluffier breeds even more so. If you're thinking about getting a small fluffy dog, here are some excellent choices. A regular sized American Eskimo would be considered a medium size dog, but this lovely and sweet dog comes in a toy and mini version as well. Toy "Eskies" are 6 to 10 pounds and minis are 10 to 20 pounds. 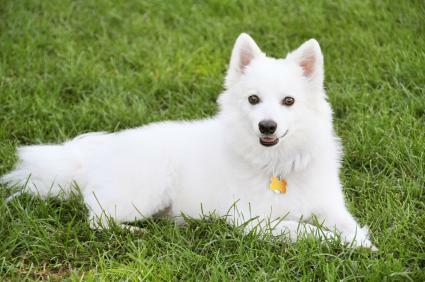 This breed is known for its distinctive white long coat although some also come in ivory tones. Their fluffiest part is their curled tail which will be wagging constantly as this is a generally friendly and happy dog. They do need regular grooming to keep their coat healthy and to reduce shedding. This includes at least two brushings a week or more. They do not need regular trimming though, so their grooming needs are not excessive. 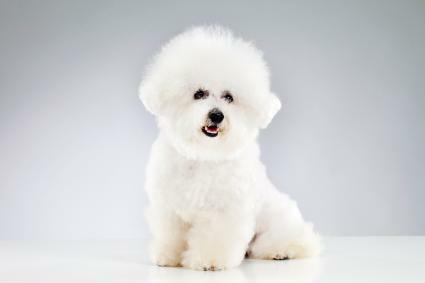 Another fluffy white dog, the Bichon Frise has a genial and outgoing personality. Bichons run between 7 and 12 pounds. 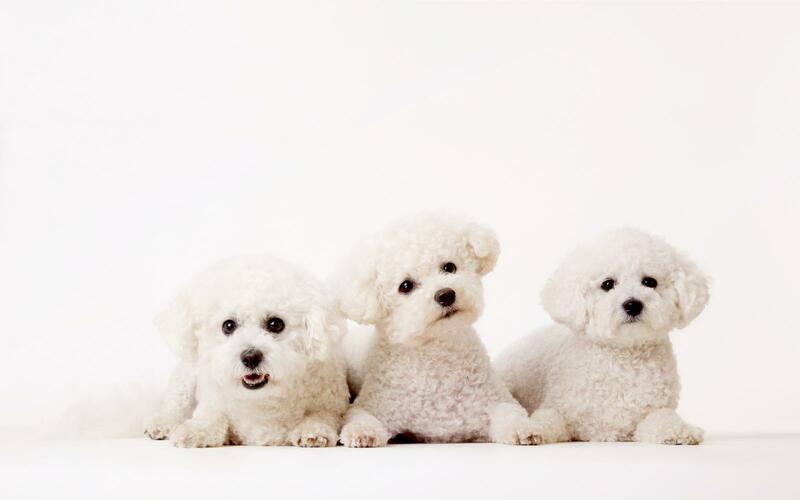 Their coat is pure white, and they are referred to as the powder puffs of dog breeds. This is not a breed to own if you don't want to deal with grooming. Bichons require brushing several times each week and some dogs will need daily brushing. They need to be bathed biweekly to keep their coat white with a special shampoo. Hair around the eyes needs trimming and cleaning to avoid tear stains. You will need to take them to a professional groomer for clipping every 4 to 6 weeks unless you are able to do this on your own. Cockapoos are a very popular designer mixed breed that makes a wonderful family pet. Cockapoos are a mix of Cocker Spaniels and Poodles. Their coats may vary slightly due to the mix of parents, but generally, it's long and can be either wavy, curly or straight. They are not heavy shedders and are considered hypoallergenic. Their coat comes in many colors including black, blonde, chocolate, red, roan, tan and patterns like merle, parti-color, sable, ticking, tri-color and tuxedo. Their coat needs daily brushing and trimmed if you notice mats. Some popular professional cuts for Cockapoos include summer, teddy bear and Cocker Spaniel cuts. 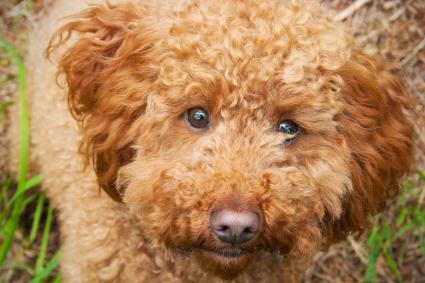 This friendly dog is not as well known as some other small fluffy breeds. Since they are not recognized by the AKC there's no one breed standard. Usually, they are about 12 to 15 pounds with 18 pounds being the maximum. They have a long, shaggy coat that is usually white although some Cotons have cream or silver coats. Their fur has a wavy texture that causes it to "fluff" around the dog's body. Cotons need constant grooming including daily brushing. They are not heavy shedders and tend to have many mats. 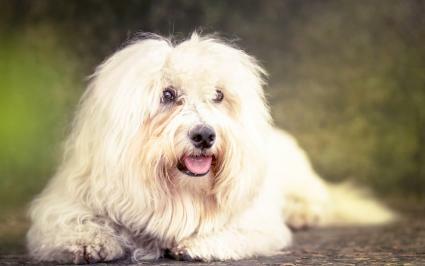 Coton owners often keep their dog in a professionally groomed puppy cut to help minimize their daily grooming routine. The Löwchen, or "little lion," were bred to accompany European royals. They get their name from the lion grooming cut used most often with the breed. Adult dogs are between 8 and 18 pounds. Despite their long, dense hair they are not very hard to groom, other than brushing them a few times a week and bathing every few weeks. Their hair can be left natural for the full fluffy effect or trimmed by a professional groomer. The Löwchen is known for being loving but laid back and would do best in a home without a lot of activity and older, calmer children. They are intelligent, spirited dogs and enjoy training and the breed can be found competing in dog sports. They are generally healthy with few known genetic conditions other than patellar luxation, progressive retinal atrophy, and cataracts. The luxurious Maltese is a favorite of glamorous owners who want a dog to match. 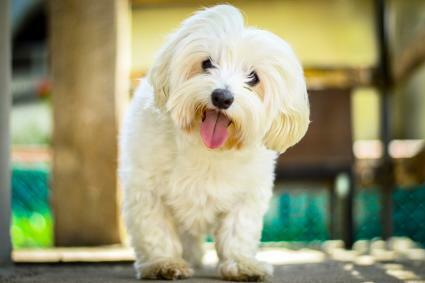 Despite their sweet, petite appearance, the Maltese is an energetic, playful dog that adores its people. This toy breed is between 6 and 9 pounds full grown. Aside from their personality, their coat is their standout feature. It is long and silky and flows as the dog moves. They are known for a snow-white coat, but some dogs have a more ivory color. Grooming needs are high and include daily brushing and checking for mats. They will need weekly baths with special shampoos for white dogs as well as cleaning around the eyes for tear stains. Maltese owners enjoy using a variety of grooming styles for their dog and a trip to the groomer is a regular occurrence. 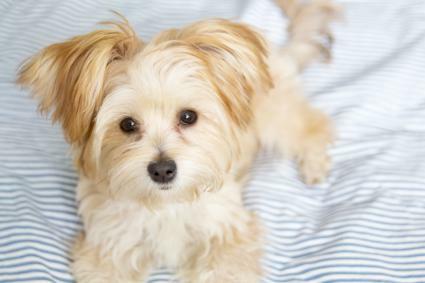 Another crossbreed dog, the Morkie is an adorable and fluffy addition to any home. The Morkie is a mix of a Maltese and a Yorkshire Terrier and like their parent breeds, they weigh around 4 to 7 pounds. A Morkie's coat may tend more to the characteristics of one parent over the other. 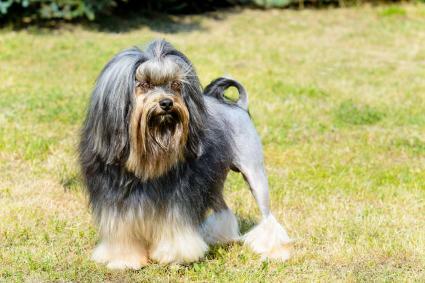 Some will have a flowing coat like a Maltese while others will have the silkier hair of a Yorkie. They come in several colors including white, brown, black, tan and parti. They are considered a hypoallergenic dog. Their grooming needs are high, including daily brushing, eye cleaning and trimming and monthly bathing. 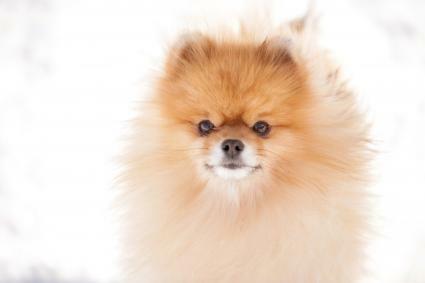 A true fluffball, the Pomeranian is a lively and confident little dog. Pomeranians are toy dogs weighing in between 3 to 7 pounds. They have a long, double coat and come in red, orange, white or black. Their beautiful fluffy coat is high maintenance. They will need a brushing at least 3 times a week and a bath every 3 weeks. Their fur is susceptible to matting and you will need to keep a close eye to make sure they do not develop. They are a favorite of professional groomers and there are many cut options that will make them look like little teddy bears. If you love big fluffy dogs but don't have the space, consider a Pomsky! The Pomsky is a mix of a Siberian Husky and a Pomeranian. They can come in toy, small, and medium size with a weight range of 7 to 38 pounds. 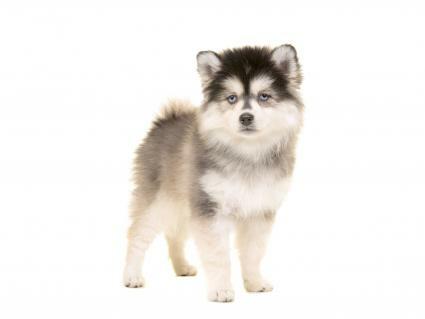 Their coat texture is like a Pomeranian's fluffy, standout fur but tends to come in common Husky colors such as grey and white, white and red, and merle. The Pomsky has the energetic, outgoing personality of a Pomeranian and the intelligence of a Husky. This is a dog that will get bored easily and needs exercise, training and enrichment. They will need regular grooming like that of their Pomeranian parent. They also are heavy shedders. 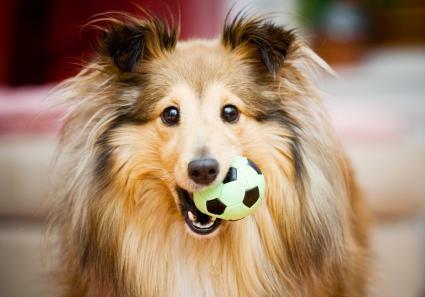 The toy Sheltie is a miniature version of the Shetland Sheepdog. Although its not recognized by the AKC, the dog has a big following among breeders and Sheltie lovers. Like their larger relatives, these are very smart dogs that excel at dog competitions like agility. They enjoy training and working with people. They're very friendly and good-natured and are an excellent choice for families with children. They have a long double coat that is thick and fluffy when brushed and properly groomed. Their coat has a distinctive fluffy "mane." Their coat colors include sable, mahogany, merle, black and black with tan highlights. Due to their thick coat, they need regular grooming including brushing and trimming weekly. Their fur can become matted easily and owners should check them often to prevent them. This breed is also a heavy shedder so not a good choice if you don't like dog hair everywhere! There are, of course, many other choices if you're looking for a small fluffy dog. Whichever dog you choose, realize that the beautiful fluffy coats mean moderate to intense grooming requirements so be ready for a lot of maintenance and regular trips to the groomer.